OK, ok. The title is a little long. But I am on cold meds. I can be highly amusing while on cold meds. Or at least I like to pretend I am amusing while on cold meds. I talked a little bit about my fear of diving a couple of posts ago. I am here to tell you that normal people are afraid of jumping into open water 60 feet deep while strapped to 60 lbs of equipment and then attempting to breathe underwater like it is no big deal. I will gladly affirm that it is a big deal. We are the normal ones. All those other people, who just hop in the water, float down to 90 feet while barely clearing their ears–they are the abnormal ones. Not us. Them. I mean really, as a certified diver (SSI–read it and weep you PADI snobs you:)), I have had dozens of people say to me, “Oh, I could never do that. That sounds so scary! I would be so claustrophobic! I don’t like the water that much.” So, if you take all the people in the world who DON’T have any inclination to dive and never will, compared to the natural divers who were apparently born on the wrong planet (I am betting there is a planet out there where this kind of behavior is normal), I think there is a clear case to be made that most people think diving is scary. So, if I think it is scary, why do I do it? Well, my significant other really really really begged asked me to. Plus, my dad and his wife, as well as my brother and his wife, were certified years ago and have been enjoying scuba experiences together. And I hate being left out. I like to be right in the middle of the action. When we go on trips together, I don’t want to be the one missing out on all the inside jokes and scuba stories. Plus, I am a naturally curious person who thinks sea life is amazing, and that alone was enough to get me in the water. As you can see I still won’t let go of my mask, but I was OK enough to give a thumbs up! We got certified with a fantastic dive shop and a very patient instructor. My chest hurt trying to breathe underwater. Breathing is something we do all the time without even thinking about it. But when breathing underwater, you are suddenly painfully aware of every moment of breathing. Initially it is very difficult to breathe normally. Additionally, my ears were simply not cooperative. I could hardly go down ten feet. Since I don’t live anywhere close to the ocean, our open water dives were in naturally heated lakes that were murky with nothing really to see. I got vertigo and I hated it. While being turned around I went down when I thought I was going up and I hurt my ear, which took several weeks to feel back to normal. But, despite this rough beginning, and even taking into account my panic attack in Mexico, I think I can actually do this. My ears (my biggest concern) cooperated perfectly. And the draw of underwater life is undeniable. Believe me when I tell you that it is so cool. Considering the fact that I am not a “natural,” I think I might have some good ideas for other “un-natural” newbie divers. Of course, please consider the source. I am not an expert. These are just some things that helped me. When diving, descend and ascend slowly. Do not feel pressure to keep up with your group. Tell your Dive Master in advance, and be comfortable with the scuba hand signals to indicate you are having problems with your ears. A bonus too: if you certified at a HIGH ALTITUDE like I did, you may find that your ears do much better at sea level. High altitudes make it that much harder to clear your ears. 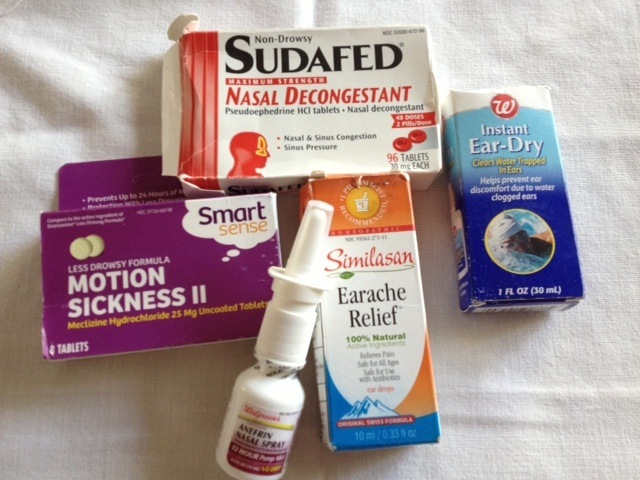 Here is my “ear care” scuba kit: Sudafed, Ear dry, 12 hour nose spray, all-natural ear pain drops for slight discomfort. 2. Wear a full wetsuit or dive skin to dive. I have my own 5 mil wetsuit and I love it. For me, diving in 85 degree water with a wetsuit is not too much. You lose body heat much faster in water, even if it is warm. But even if you are someone who does not get cold easily, wearing at least a full dive skin is preferable in my mind. Then you can wear your skin under your wetsuit for extra warmth (and it makes getting into your wetsuit a lot easier). A lot of people like “shorties” but I like to have my legs fully covered. Some people wear the full dive skin and then put the shorty on top to keep their core warm. I don’t want to get stung by anything, or accidently bump coral. And, if I am at the bottom and want to kneel down, the built in knee pads are da bomb. I have enough to worry about without having to fret about getting touched by something icky. Several in our party came back with minor stings and skin irritations. Not me though! They didn’t seem to mind, but I am a baby about it. I love my wetsuit. It adds buoyancy, so it is fantastic to use while snorkeling too/. 3. Anxiety is often fear of the unknown. Name your fear to help control it. During my last panic attack (not a regular phenomenon for me) I felt pretty out of control until I said, out loud, “I don’t want to do this, I want to get back in the boat.” Once I said that, I was able to calm down. Weird, huh? Focus on deep, steady breathing if you are feeling anxious. In a fairly recent study of panic in divers, the conclusions the researchers came to is that repeated practice and training is what helps divers not act rashly when panicked. So, be sure to take a yearly (at least) refresher course and go diving as often as you can. The study also reported that over 50% of divers report having a panic or “near-panic” situation at least once in their diving experiences. It is a common phenomenon. 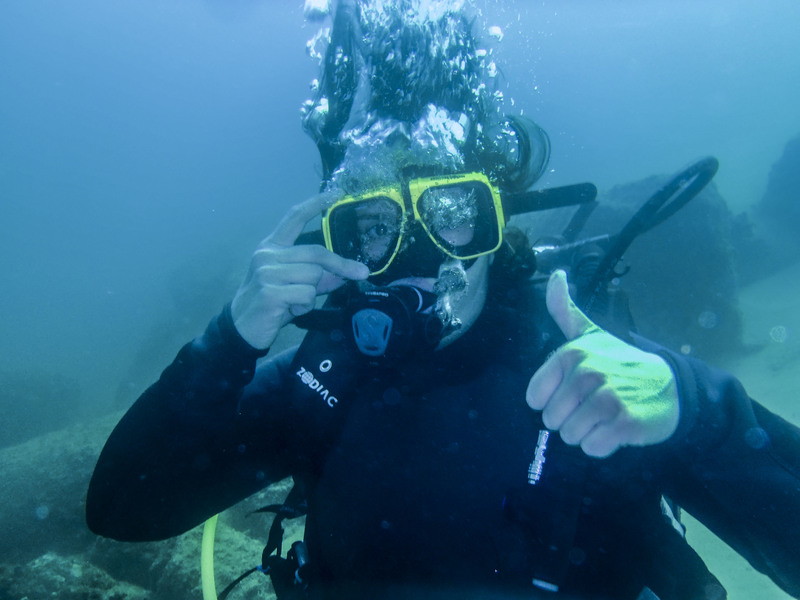 Scuba is not a completely risk-free venture, and that same study indicates that panic is a major factor in nearly all scuba injuries and deaths. As a scuba novice, you need to be prepared as much as you can be; meditate, breathe deeply, and do your best to mitigate panic responses. 4. If at all possible, buy your own equipment and use it. To eliminate some of the unknown, I like having some of my own equipment. I have my own mask, snorkel, boots, and fins, and I hope to get my own BC before our next trip. If you have your own BC you can get weights that fit in the BC instead of wearing a weight belt which is infinitely more comfy. You can usually get completely outfitted in rental gear by a dive shop, but it all won’t be specific to you as if you purchased it for your own body. Also, make sure your equipment is still in good working condition a couple of weeks before your dive trip. This is something I should have done more thoroughly. I did a refresher course to prep for my trip, during which my mask kept flooding. The Dive Instructor said my mask looked too big for my face, but I pretty much ignored his advice to come by the shop and get fitted for a new one because it was still in very good shape, and I didn’t have problems with it before. I should have listened. I didn’t realize that some recent weight loss came off my face and impacted how the mask fit (again, why not from my thighs?) Part of what contributed to my panic was this mask that kept flooding. Once I was able to get a mask from the dive shop that fit better I was able to quit worrying about it. A lot of Dive Masters are comfortable constantly clearing their mask, and will dive with stubble and such because it does not bother them. I am not to that point yet. I only want to clear my mask if I absolutely have to. PS–I know it is not big deal, but I have a hard time not getting the nasty nice “icks” at the thought of using a snorkel someone else has slobbered on. 5. If the idea of not being able to communicate well while underwater makes you nervous, consider purchasing an underwater Etch a Sketch. Mine was about $15 and has a clip that I use to attach it to my BC. I haven’t even used it in action yet, but just having it makes me feel better. And honestly, I am still trying to figure out buoyancy so I am not sure I would have the skills to use it yet. But just having it calms me. Get enough sleep the night before, eat a decent breakfast, stay hydrated, and bring snacks for in between dives. Some dive shops provide full meals; others at the very least have cookies, crackers, and water. I throw in some trail mix for a high calorie/protein snack. You burn 700-800 calories an hour while diving, so you need to keep up your energy! Sea sickness can really ruin a dive or snorkel trip. But be sure to try out meds in advance to see how they impact you. For me, one Dramamine does the trick. Two knocks me out. The three day patch may be great for some people, but it made me woozy. Some people swear by the little wrist bands that help alleviate sea sickness via pressure points. Other people find that candied ginger works well. Experiment in advance if you are prone to sea sickness so you know how you react and what works best. PS–If you are getting into a choppy ocean, take my word for it–the best place to go is down! Water that is too choppy for comfortable snorkeling is often just fine once you are down to 30 feet or so. Then the water is much calmer. So if you are feeling icky on the surface your best bet may be to get down there! Contact the dive shop and ask about their track record regarding new/nervous divers. Ask if there is a particular dive master who is especially calming and encouraging to new divers. Request a smaller group (4 divers per dive master instead of 8). Read reviews on Tripadvisor, and ask your local dive shop or instructors for recommendations. DAN (Divers Alert Network) has a diving insurance plan. It is not incredibly expensive, and it covers medical costs, transportation, and other expenses associated with diving accidents. The DAN doctors can also help coordinate necessary treatment. I know it is not fun to contemplate “what if” scenarios, but it is wise to do so. We are members of DAN; it gives me comfort knowing I can get help if need be. So far so good! I will be very happy if I never require their services. 10. Remember that you are doing something AMAZING and try to have fun! Like I mentioned earlier, diving is a sport that opens a whole new world to you. Buy books on reef fish for the locale your are visiting, and get excited for what you might see. Plan trips with other divers, and focus on the team-like nature of diving. Diving is such a unique experience; it is something you will never forget. 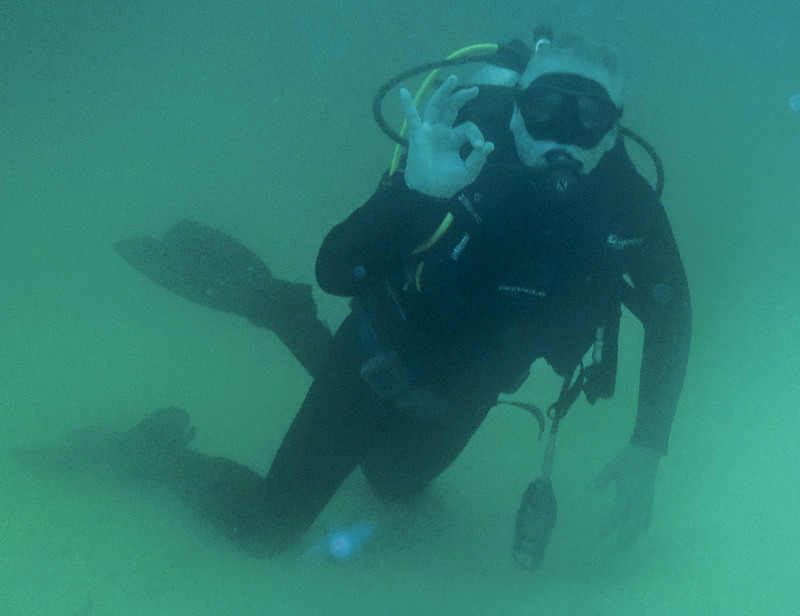 My Dad giving the underwater salute! He is getting close to 70 and still diving! You are an inspiration and my hero. I wonder if I could conquer my fear of water enough to snorkel, let alone scuba dive! Keep it up, Friend! Get a snorkel that self seals. Makes all the difference! Then you don’t have to worry about getting a mouth full of sea water. So much easier. You can do it! Really great blog, I am PADI AOW now but still think of myself as a newbie. Every dive trip I have some experience that could put me off – being sick under water, struggling to get on the boat in rough seas, getting stuck in a hole (yes really) but I keep forcing myself to carry on because I love the underwater world. I had a full on panic attack when learning to dive and never thought I would make it but I did because I REALLY wanted to. I think sometimes being a little nervous is not a bad thing, I make sure I re-read my manuals often, stay with my buddy and check my equipment more often than most. Maybe one day I will blog about my adventures in diving! Hey Jody! Thanks for stopping by and commenting. I am so glad to hear from other divers who struggle like me, but keep carrying on anyway! I bet there is a great story behind getting stuck in a hole! I think you are right though. I wise person told me that complete confidence can lead to cockiness or result in foolhardy decisions. It is probably always best to be just nervous enough that it heightens our senses and gets that adrenalin going so we can think clearly. Panic is not good, but intense focus is great. I re-read my manuals too, and I like to take refresher courses. I would love to hear about your dives! Tonight I’m trying again at a beginners intro class close to home. Again in a pool, but since it’s in a regular sized pool rather than a training tank, I’m less nervous – sort of. No clue how I’ll feel once I’m in the water! And think I’ll have more opportunity to go slowly. So nice to hear that other people get nervous diving and are able to overcome it – one day I will be able to see and enjoy the fishies! I am so glad this post may have been helpful in some way! I think it is good to know that most people when beginning are anxious, and some of us will probably always be. Just remember to breathe and don’t let anyone rush you! Good luck tonight! 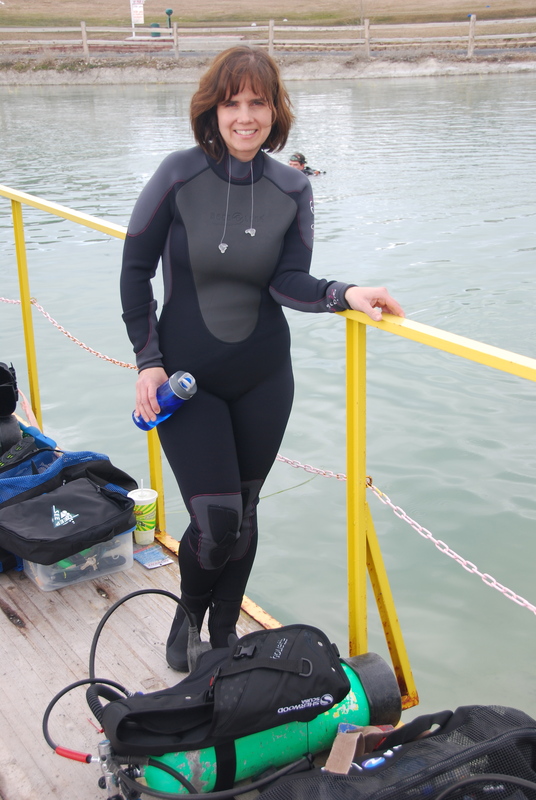 Thanks, really enjoyed this, I am a real newbie (at an old age – mid 40’s), 6 dives incl. the course, but trying to fit more in while we still have warmish weather. Saturday will be my 1st boat dive which isn’t on the course and I’m nervous but my partner and his friends who are all experienced will be there. It’s amazing being underwater and I’m hooked, though when descending my right hand never stops being on my nose to equalise (boy that hurts if you don’t). Loved your comment about the slate not being used as you are still working on buoyancy, that’s my biggest issue and still don’t have the confidence to unhook/hook things up yet as all I seem to focus on is not sinking or floating. It sounds like you are doing great! I think buoyancy is elfin items trickier. We are plotting to go diving for our 25th anniversary this fall. Best of luck to you! Don’t give a thumbs up to signal you are having a good time! It means ascend when used by a diver! Thanks! Although, Ironically, it was the Dive Masters getting us to “pose” for underwater pictures! I wonder if there are any differences in the Scuba signs depending on your certification? Treat your ears with respect, like any other mussel in your body the eustachian tube needs regular exercise to keep it fit and mobile. Do not think you can force it to clear. Regular free diving will help exercise and flex it’s action as you will know from your training the greatest % pressure change is in the top 6M (20 feet) therefore practice in a pool is a very good controlled environment. Strong menthol sweets can help clear mucus etc if that’s the problem. Excellent advice! I never thought to practice like that. And since I am going to Cayman this summer I should start now!